Easter will be upon us in a few short weeks, and I think it’s essential to spread the word on how to keep your cat safe during the holiday. Follow these tips to ensure a happy and safe celebration for everyone in your home! 2. Keep Easter grass away from your cat-Baskets filled with Easter grass may look cute but the grass can be fatal to your feline friend. Ingestion of the grass can cause intestinal obstruction and an emergency trip to the animal hospital! Use brightly coloured tissue paper or patterned cloth in festive colours to fill the bottom of the baskets instead. This way your baskets will still look great and your cat will be safe and sound. 3. Don’t share your dinner-This is a good tip not just for Easter but in general. Cats should only eat…well, cat food. I know that with my guys specifically, they’ll look for tiny pieces of ham or turkey that fall on the floor and are waiting at the ready to steal a piece. Don’t do this! It not only encourages bad behaviour that is hard to stop after it starts, but it’s not healthy for your cat. Fat and bones will cause significant problems for your cat if eaten by accident and garlic and onions used in stuffing are toxic. Keep your cat away from Easter dinner so that everyone can enjoy their own meal. That includes your feline friend. 4. Keep an eye on chocolate and candy-Hiding Easter eggs for youngsters is a fun way to celebrate Easter as a family. 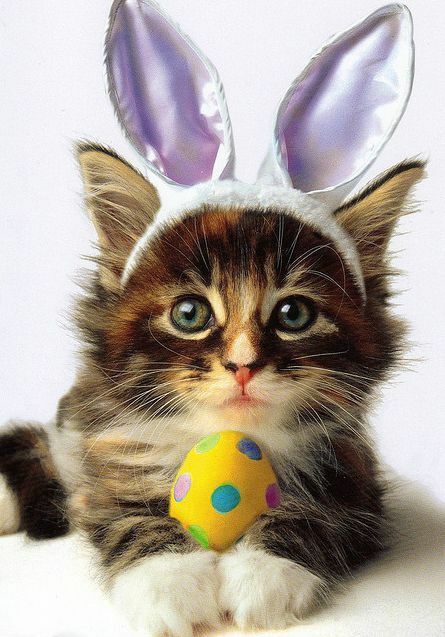 Keep the celebration safe by having a list of where you’ve hidden all of the Easter treats to ensure that kitty doesn’t sink his teeth into some forgotten chocolate. Chocolate is toxic and can be fatal to cats! Consider keeping kitty confined to his room while your family hunts for the eggs to ensure his safety. I hope that you’ll find these tips helpful during your holiday celebration. *These guidelines were originally posted by our friends at Guelph Animal Hospital.